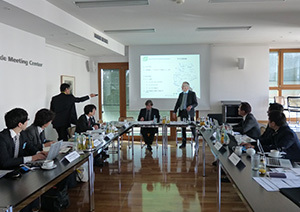 On October 5-13, 2014, National Federation of University Co-operative Associations (NFUCA) visited Berlin, Frankfurt and other places in Germany to visit German National Association for Student Affairs (Deutsches Studentenwerk or DSW) and conduct market research on e-books. 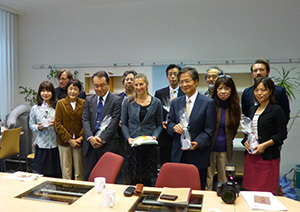 Officers and staff of NFUCA, executive directors of NFUCA members, officers of and employees of University Co-operatives Mutual Federation (UCMF), as well as professors from Community for Innovation of Education and learning through Computers and communication networks (CIEC). In Berlin, we visited the headquarters of DSW and The Studentenwerk Berlin. We also participated in a seminar on internationalization of higher education and learned about the current state of higher education in Germany at the German Federal Ministry of Education and Research. 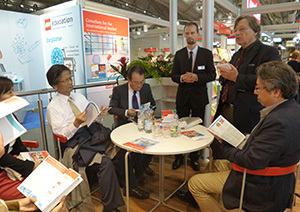 We also learned about the platform at Goethe University E-Learning Center, visited the Frankfurt Book Fair, and heard an explanation about Information Center of German textbook publisher Cornelsen Schulverlage. 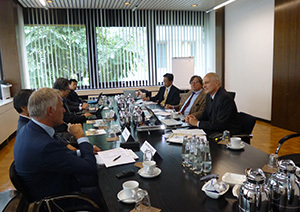 NFUCA and DSW has been conducting exchanges of more than 10 years. Both of the organizations have been supporting services for the improvement of student life. Next year DSW plans to visit Japan to learn about internationalization programs in some universities and joint purchasing of the dining halls.